“In Sacred Union” Lincoln Monument - Paula Slater, M.A. Paula, we're in love with you and your work of art, and we would like to present you with a small memento of our great appreciation!" "The Lincoln Bronze is great!!! All I can say is WOW!!!! Thank you so much, Paula. The installation today went so smoothly. Now everyone is really excited." Over 70 professional sculptors and sculptor teams nationwide submitted qualifications for this important public commission. The field was then narrowed to 20 semi-finalists and then down to 5 finalists. Slater was honored to be chosen to sculpt the monumental 10’ high full-figure Lincoln portrait. The elegant site-plan designed by Brad Bourgoyne tells the fascinating story of Lincoln’s search for his parent’s marriage bond. A bronze plaque with the timeline is installed on the back of the 6’ high granite base and bronze copy of the actual marriage bond graces the front of the base. Slater sculpted this version of Lincoln without his beard because he visited Kentucky in 1858 in search of the bond, but did not start growing a beard until November of 1860. During his political campaigns and life as President, Lincoln was dogged with vicious rumors by his political rivals that his parents had never been legally married. Lincoln searched in vain for the marriage bond, especially in Elizabethtown where he thought his parents had been married. Lincoln went to his grave not knowing if the marriage bond existed. A friend of Lincoln’s continued the search after Lincoln’s death and found it in the Springfield, Kentucky Courthouse. Now the bronze portrait of Lincoln gazes towards the old 1816 courthouse where his parent’s marriage bond was finally discovered thirteen years after his death, and where it is still housed. Lincoln’s search has finally ended…. 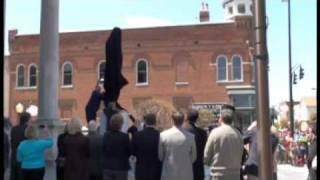 For the unveiling and dedication Main Street was roped off as 700 to 800 people attended the wonderful event. The ceremony included the Washington County Marching Band, the Saxton Cornet Band,and male vocalist Mr. Issac Frye. Slater was asked to be a keynote speaker, along with Senator Dan Kelly, Representative Mike Harmon, and the Mayor of Springfield. This Monument has since been declared a Kentucky State Landmark and is a part of the Lincoln Heritage Trail and the Civil War Heritage Trail. The Lincoln Monument was also featured in a TV commercial by Blue Grass Cellular–catch a quick glimpse of Lincoln lifting a cell phone to his ear in their commercial at http://www.youtube.com:80/watch?v=b7Y0jkOiqyM and on their website. It is great fun to see what can be created these days through special effects!